refers to the combination of text and video segments to create an integrated viewing experience (video + narrative = videative). The text explains the video and the video exemplifies the text. Our videatives help you see what children know™ and thereby help you better support their learning. Subscribe to our growing library of streaming video clips with supporting text. Easily search our 350+ titles by the category: age, material, setting and concepts to locate titles to share with your students, staff, or families at no additional charge. Access through IP Authentication or your eProxy. Purchase any individual video title and instantly download to your computer. We also offer an array of Videative CD sets, including a set of 52 of our classic videatives on 3 CDs for a $550 savings. And look for our new Learning Moments series of CDs. Stream from the internet any of our 360+ video titles or download video files to your computer. Increase your understanding of children's thinking and learning. View these short video clips on any device. Present at full screen from a video projector. Distribute to your students over the Internet. Visit our free archive of video clips from six months of our Videatives Views newsletter. 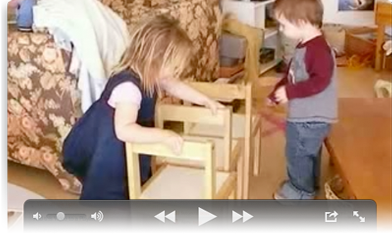 Videatives make general principles of child development and early education come to life. 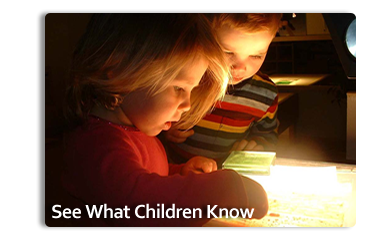 Students learn to "see what children know", not through testing, but through careful observation. Teachers have higher-level conversations with children. Help children reflect on their actions and offer them better support for their thinking. Stream video clips to your students at no extra cost. Learn how. 3 Discs containing all 52 classic Videatives and their high resolution master clips for a $550 savings. The text explains the significance of the children's work and play with micro-clips that give visual examples. Or play the master clip without the text. April's playlist shows children using the body as a pretend symbol. 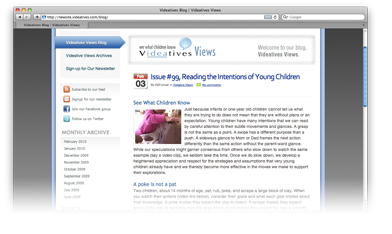 Browse past issues of our Videatives Views Newsletter. Watch the video clip included in each issue for free. All of these great clips are part of the video library in our Video Streaming Service and our eStore. Access our growing library of 360+ streaming video clips through IP Authentication or eProxy. The number of video titles that include Closed Captions continue increasing. Closed Captions for specific video titles are available by request. Each CD has 10+ high resolution video files plus text on topics such as Outdoor Play, Children with Learning Challenges, Art as Literacy, and How Infants Learn. Order from our eStore CD section.